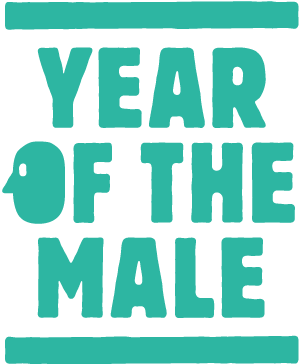 My Year As A Man : My role in making 2014 "Year of the Male"
My role in making 2014 "Year of the Male"
2014 has been declared the Year of the Male by the male suicide prevention charity, CALM (the Campaign Against Living Miserably) who are co-ordinating a "year-long exploration and celebration of what it means to be a man". To mark the launch of the initiative CALM has published a "Charter for Contemporary Man" that I played a role in drafting in partnership with leading psychologists and academics, the CEO of Men's Health Forum and the team at CALM. We may have different views on why we need a Year of the Male, but we broadly agree that there's been a huge shift in men and women's roles in the past 50 years. We've signed this charter because we believe the time has come for us to ask the big questions about what it means to be a man in the UK today and what changes we need to make to create a fair and flourishing society that works for everyone. From an early age, boys start to see and hear messages about what it means to be a 'real man', how they're expected to look, act and express themselves. Phrases like 'boys don't cry', and 'man up' remain in everyday usage and men in the public eye who show doubts and difficulties often still find themselves shamed, rather than celebrated. One study found the most common word used to describe teenage boys in newspapers was “yobs” and that the best chance a teenager had of receiving sympathetic coverage was if he had died. In 2012, over 4,500 men killed themselves, an average of 12 men a day, and 77% of all suicides were male. Suicide accounted for the deaths of more young men than road traffic accidents and murder combined. To what extent do men feel able to live up to their own, or other peoples', expectations? We are asking the media to tell stories that reflect the rich and diverse lives that men lead and are asking the public to tell us what it really means to be man enough. The UK’s Equality Act 2010 is said to be one of the most comprehensive equality laws in the world. Under the Act, all public sector bodies must have 'due regard' for advancing equality of opportunity between men and women. Yet men are still less likely to access preventative care services and there are many areas of life where men and boys fare particularly badly. 73% of adults who ‘go missing’ are men and 90% of rough sleepers are men. Men are three times more likely than women to become alcohol dependent and 79% of drug-related deaths occur in men. Men make up 94% of the prison population. Men and boys from all backgrounds have shorter life expectancies than women and girls of the same background. Boys from all backgrounds are underperforming girls at every stage of education. So what it is about modern society in the UK that is failing boys and men so badly and generating these statistics? The 2007 Gender Equality Duty requires all public authorities to consider the needs of men and women when providing services. We are asking public services to tell us how they are addressing the specific needs of men and boys. We want to showcase examples of best-practice throughout The Year of The Male. Despite the changes in gender roles men are still more likely to be the main breadwinner in their family, more likely to be in work, more likely to work full time, more likely to work longer hours and commute further to work, more likely to work in the private sector, more likely to be self-employed and less likely to work in the public sector and more likely to work in dangerous jobs with 96% of workplace deaths each year being men. Research on work-life balance shows that 82% of fathers want to spend more time with their families and men are more likely to report work-life conflict. Men who fail to be economically successful are more likely to be unemployed, more likely to be homeless and more likely to kill themselves. So what type of economic role do men want to play? Do they want to have more choice to work part-time, to work in professions traditionally dominated by women, to be in relationships where they're not the primary breadwinner - and are employers ready and willing to give their male employees more choices? We are asking employers to help us discover what type of choices men want to have about the jobs they do and working patterns and what more could be done to support men working in high risk industries and men who feel unable to provide economically for their families. Today’s father is no longer the traditional married breadwinner and disciplinarian in the family. He can be single or married; employed or stay-at home; gay or straight; an adoptive or step-parent; and a more than capable caregiver to children facing physical or psychological challenges. While there is an expectation that men and women share childcare and breadwinning more equally, the laws on parental rights, leave and family benefits position most mothers into the role of primary carer and most fathers into the role of primary earner. Where relationships have broken down, the law can hinder rather than help fathers who want to be fully involved in bringing up their children. More than a million children in the UK have no contact with their father while they are growing up and there is a serious lack of male role models in our primary schools - in England and Wales one in four primary schools has no male teacher, and 80% have fewer than three. Yet positive male role models are known to have an important impact on children’s social and emotional development - the absence of fathers is linked to higher rates of crime and teenage pregnancy. Throughout The Year of The Male we want to foster debate about the roles, responsibilities and rights of fathers. We want to counter the stereotype of the “deadbeat dad” to find out what men really want from family life and to hear from fathers about their experiences. You can follow discussions about Year of the Male at the Malestrom blog and look out for the Year of the Male website launching soon. IF YOU'D LIKE TO DOWNLOAD A FREE CHAPTER OF MY NEW BOOK "EQUALITY FOR MEN" JUST CLICK HERE NOW TO FIND OUT HOW.